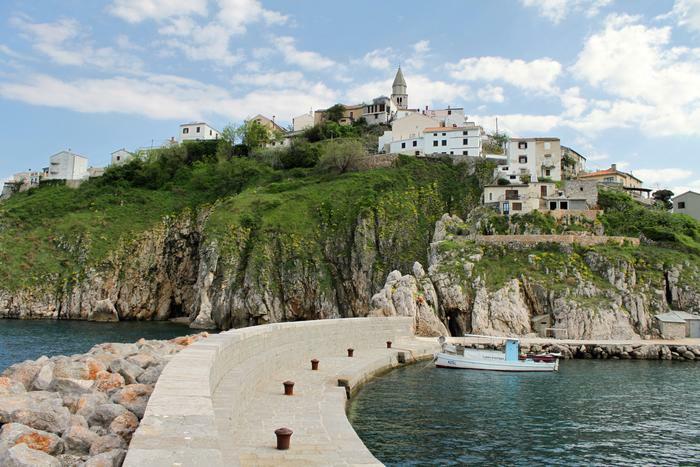 Vrbnik is one of the most picturesque towns on Krk island. Well preserved original architecture, the narrowest street in the world and beautiful landscape are just some of the attractions that Vrbnik has to offer, but if one should point out a few of them, certainly there would be town's location, Glagolitic script and wine. Vrbnik is situated on a cliff that rises 50m above the sea, with a beautiful view of the coast. Vrbnik is also one of the oldest places on the island that cherishes original Croatian cultural heritage – angular Glagolitic script. Kvarner region was a place where Glagolitic literacy started, and old manuscripts are preserved in Vrbnik church and Vitezic library. Stone fragments and inscriptions can be seen in the streets of the old part of town. White wine made from noble grape sort – Vrbnik Zlahtina – is one of the top quality wine products in Croatia, known outside the country borders as well.